As you wander through the streets, you’ll discover the city’s many restaurants and the specialties they offer, from fine dining to cosy bouchons, Lyon is known as the gastronomic capital of the world! Did you know Lyon doesn't have just just one local dish or culinary specialty, it has dozens! Paquet de couenne (rind), grattons (pork scratchings), salade de pieds de mouton ou de museau (sheep's feet or headcheese salad), the traditional Lyonnaise salad, gâteau de foie (liver), saucisson à cuire et autres sabodets (large cooked sausages), échine de porc aux lentilles, andouillette (chitterling sausage), gras-double (tripes), tablier de sapeur (veal tripe), tripe Lyonnaise.. and more, like tête de veau (veal's head), cardon à la moelle (cardoon with bone marrow), boudin aux pommes (black pudding with apples), volaille demi-deuil (poultry with truffles), followed by cheeses: strong or fresh cottage cheese whipped with herbs and fresh cream known as la cervelle de canut (which literally translate as ‘silk-workers' brains’), and pastries such as the famous ‘bugnes’. 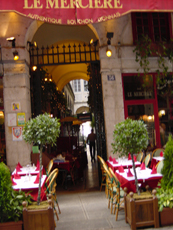 Lyon also owes its fame to the other river that is said to run through the city: Beaujolais wine. Thanks to the talent of local chefs and Mères, Lyon is a real contender in the Michelin Star ‘wars’ and the Gault and Millau " culinary rivalry. Lyon owes its title to its long-established culinary tradition and culture, and as there’s no better way to learn than to practice, why not practice the art of fine dining, Lyon style! After a welcome coffee and information session during which you’ll be given your log book, map, pen and badge etc, the teams will set off on their urban adventure! Our tour will take you down some of the most picturesque streets of Lyon to discover our best specialties including wine, pork meats, cheeses and more. At various ‘check points’ along the way local producers and artisans will be happy to answer your questions during tastings , particularly any questions you have concerning the treasure hunt!.